Our office is a proud Biolase Center. An FDA- approved treatment for gum disease, laser dentistry avoids the use of traditional periodontal surgery by utilizing specialized lasers to clean out periodontal pockets of bacteria in the gum tissue. It is also the only procedure that helps the bone supporting the teeth regenerate, while providing a more comfortable and effective treatment than traditional gum surgery. Using a Waterlase® by Biolase laser, there are no scalpels or stitches needed to restore your gingival health. Using laser technology, bacteria and diseased gum tissue are gently removed and the body heals itself naturally. What can Waterlase® Dentistry do? How does Waterlase® Dentistry work – is it safe? 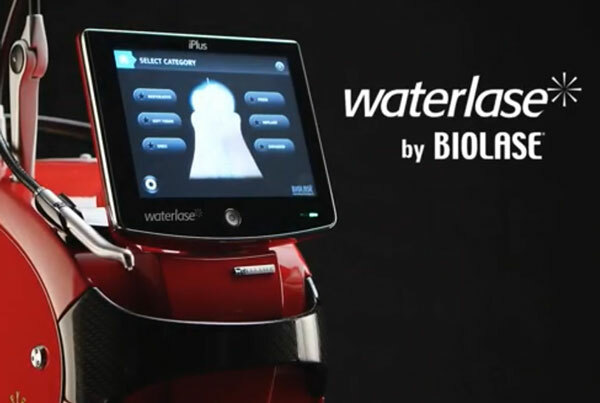 Developed by Biolase, the leader in laser technology, Waterlase® Dentistry is one of the most advanced dental treatments available and has been used to treat millions of patients. Waterlase® lasers are a FDA approved technology that send a highly concentrated light energy through a specialized handpiece which is aimed at the area in need of treatment. These lasers were specifically created to safely and effectively treat teeth, gums and other soft dental tissues. and and sends it through an optical fiber to its handpiece. Your dentist will aim the laser energy at precisely the areas that are to be treated. Laser light can be harmful to the eyes, so it is very important that the dentist, the patient and any others in the room wear protective glasses during the use of the laser.